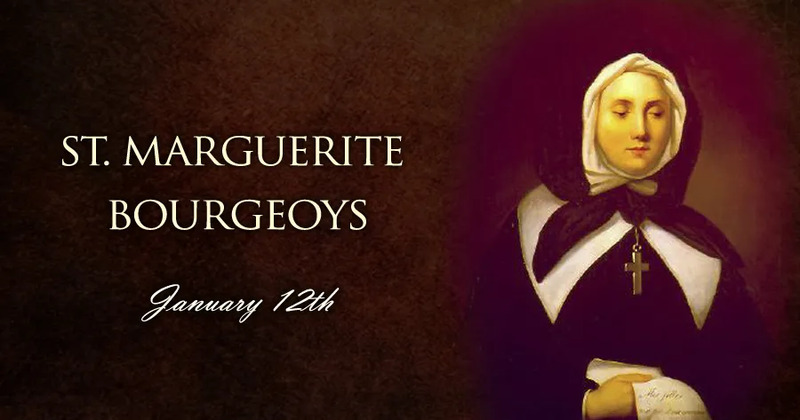 On Jan. 12, Roman Catholics remember Saint Marguerite Bourgeoys, who not only founded a religious congregation, but was also instrumental in establishing the Canadian city of Montreal. Marguerite Bourgeoys was born on Good Friday of 1620, during a period of both colonial expansion and religious strife for Europe. She was the sixth of twelve children born into the middle-class household of Abraham Bourgeoys, a merchant, and Guillemette Gamier, in the northeastern province of Champagne in France. By her own account, Marguerite had been “very light-hearted and well-liked by the other girls” while growing up. Her turn toward God's calling began in 1640, not long after her mother's death. On Oct. 7 of that year, during a procession honoring Our Lady of the Rosary, Marguerite had a mystical experience involving a statue of the Virgin Mary at Notre-Dame Abbey. In later life, Marguerite would live out a profound imitation of the Virgin Mary – who was, as she noted, “not cloistered,” but “everywhere preserved an internal solitude” and “never refused to be where charity or necessity required help.” During the 17th century, it was unusual for consecrated women to have an active apostolate outside the cloister as Marguerite would go on to do. From 1640 to 1652, she belonged to the non-cloistered “external” branch of the Congregation of Notre-Dame at Troyes, consisting of women trained as teachers in association with the order. She also sought admission to several religious orders, including the Carmelites, but was rejected. Being turned down, the teacher from Troyes was free to volunteer for a 1653 voyage to the Canadian colony of Quebec. Life in the colony was physically very difficult. When Marguerite arrived, she found that children were not likely to survive to an age suitable for attending school. Nevertheless, she began to work with the nurse in charge of Montreal’s hospital, and eventually established her first school in a stable in 1658. They would eventually become a religious order in their own right: the Congregation of Notre-Dame de Montreal, whose sisters sacrificed comfort and security to teach religion and other subjects to the children of the territory then known as “New France.” They would live in poverty and travel wherever they were needed, offering education and performing the works of mercy. The founding of the order involved two further trips to France in 1670 and 1680. During the first, Marguerite's project received approval under civil law from King Louis XIV. The church hierarchy, however, showed reluctance toward a women's order with no cloistered nuns. Their rule of life would not receive final approval until 1698, though the Bishop of Quebec had authorized their work in 1676. Though the teaching sisters often lived in huts and suffered other hardships, the order grew. They did not dedicate themselves solely to teaching children, but also set up schools where they taught new immigrants how to survive in their surroundings. As the order expanded, Marguerite passed leadership on to one of the sisters. During the last two years of her life, the foundress – known by then as Sister Marguerite of the Blessed Sacrament – retired to pray in solitude. On the last day of 1699, after a young member of the community became sick, Sister Marguerite prayed to God to suffer in her place. The young woman recovered, while the aged foundress suffered for twelve days and died Jan. 12, 1700. Blessed Pope John Paul II canonized St. Marguerite Bourgeoys in 1982, as the first woman saint of the Catholic Church in Canada.